Allen, N. J., & Barres, B. A. (2009). Nature, 457(7230), 675. We know that in our brain, information can flow and be stored at synapses where two neurons communicate with each other via chemical signals. However, what we easily forget is that the majority of our brain cells are actually non-neuronal cells, called glia, which can be further divided into three major cell types: Oligodendrocytes, Microglia and Astrocytes. 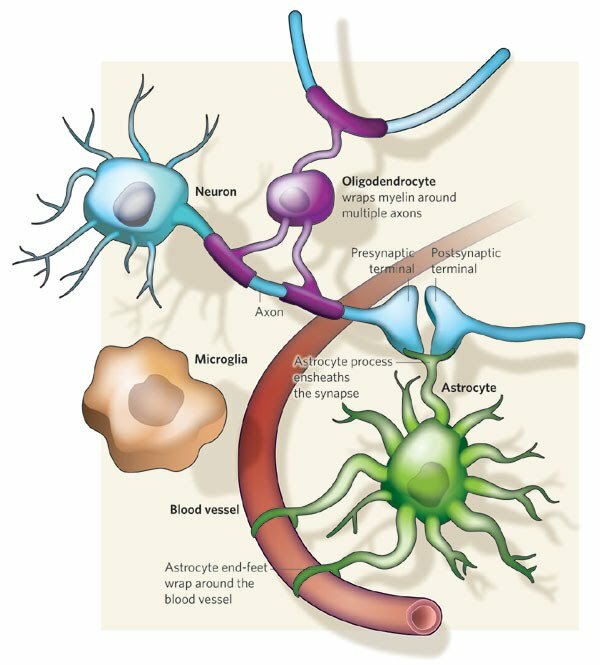 Oligodendrocytes produce the membrane sheath called myelin and surround/wrap neuronal axons to increase the speed of electrical signals traveling through the axon. Microglia, the major immune cells in the brain, respond to infections and brain injury through phagocytosis and cytokine release. Lastly, Astrocytes, the major cell type in the brain and the prime focus of our research, interact with neurons and blood vessels with their fine processes. Previously, astrocytes were thought to play only supportive roles for neurons, such as providing survival factors for neurons and controlling the concentration of neurotransmitters / ions released from synapses. However, recent work suggests that astrocytes play more active roles in neuron-glial interactions, especially in controlling the formation, maturation and plasticity of synapses. Recently, we found a novel role of astrocytes in the brain that astrocytes can mediate synapse remodeling by actively engulfing weak but live synapses, and that this process is regulated by neural activity. These studies suggest the intriguing possibility that the synaptic architecture of our brains is constantly being remodeled by astrocytes in response to our experiences. This possibility has profound implications for our understanding of many neurobiological processes, including synaptic plasticity, learning and memory, and diseases. 1. How can we control glial phagocytosis and synapse elimination? 2. Can we modulate synaptic plasticity and animal's behavior through controlling glial phagocytosis? 3. How do neurons and glial cells interact in the healthy and diseased brains? Se Young Lee and Youngjin Choi have joined as Ph.D degree students. HOW DO WE FIGURE OUT?